Bedford Journal - World champions! 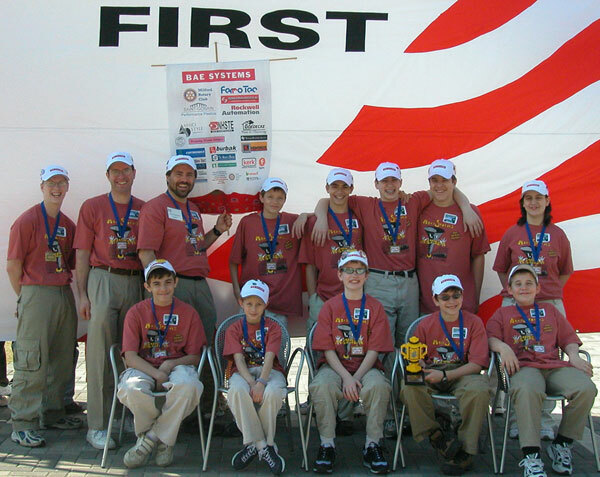 Among the Mindstorms Mayhem team of homeschoolers who won the national LEGO title are three Bedford residents: coach Ken Streeter (back row, second from left); Benjamin Streeter (back row, second from right); and Nathan Streeter (front row, second from right). After the first day of the international FIRST LEGO competition, things didn't look great for the Mindstorms Mayhem team. The home-schooled kids from several southern New Hampshire communities, including Bedford, ran into a number of setbacks with their robot, and they were facing the best teams from 39 states and five nations, so any setback could be a disaster. "The competition was really stiff," said Ben Streeter of Bedford, whose brother Nathan is a fellow team member and whose father Ken is a coach. "After the first day, I didn't think we had a chance." But by the end of the competition in the Georgia Dome in Atlanta last week, the Mayhem coaches and kids, including three Bedford residents, turned things around and won it all -- the director's award as the top team in the competition. "We are all kind of floored," said Nancy Streeter, the mother of Ben and Nathan, and wife of Ken. "It's just incredible, and we are very proud of the team and the coaches." In the FIRST LEGO League, teams of kids ages 9-14 build and program robots made out of LEGOs to solve nine missions based on problems encountered by NASA scientists and engineers in the Mars rover missions. Teams are also responsible for a research presentation. For coming in best overall, the team earned a $5,000 scholarship from LEGO to start a high school FIRST team. FIRST LEGO League is a nonprofit partnership between Dean Kamen's FIRST program and the LEGO Company and is considered the "little league" of the FIRST Robotics Competition.